If you’re relatively new to Inhabitat, you may not remember when we introduced Lovetann‘s LEGO-like prefab-modular home concept. A little more than a year later (and following on the heels of their debut as the 100% Norway headquarters during London Design Week), they’re releasing two new models for homes! They’ve also got some gorgeous photos of the fully constructed original Lovetann show home, which we thought we’d throw in to complement the shiny new renderings. Lovetann’s newborn designs, Lucida and Bloom, were developed by Snohetta in partnership with designer So Takahashi and artist Viel Bjerkeset Andersen. They both use the Lovetann building system as a baseline, but are extremely different from one other — far more than doubling the options for perfectly personal prefab. Lucida’s primary attraction is a layered, floating wall panel system that permits constant reconfiguration of space. It also features two green walls, seeded with hops vines that offer shade and color. Bloom, by contrast, consists of a single, static unit inspired by yacht design, which contains hideaway room dividers, amenities and appliances that appear only when needed and stow away easily to create more space. Though one house emphasizes fluidity and the other stability, they both revolve around elegant use of light and greenery to establish connection to the outdoors and give a sense of openness within a compact, efficient dwelling. Both will be available for purchase at the beginning of 2007. In answer to my own question of the 17 March I have concluded that Lovetann must have gone out of business as they have no active web site and no reply to email. This is a great pity as they seemed to have the makings of a great product. Tomahouse is still out there but there pricing seems to be holding them back. As for me I have now given up on prefab and have placed a contract for a build on site beach house. Also, to majchers: the design is completely up to you. You can include as many, or as few windows, as you please. Each wall is a separate panel that you can customize as a solid wall, one big window, or a wall with smaller (or larger) windows in it. Each wall and floor panel is completely customizable. I'll say it again: It really is brilliant. 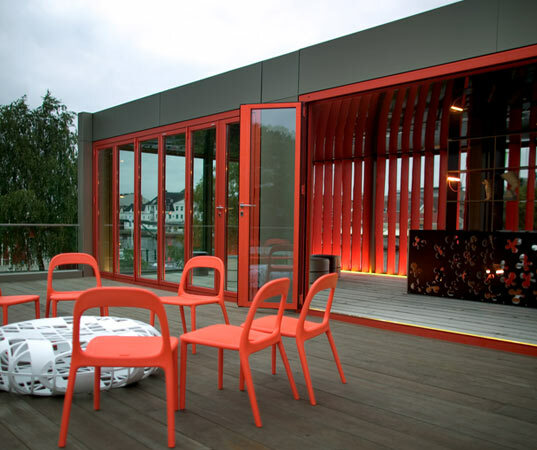 To Leonard S., Snohetta, an architectural firm in Norway, designed these modular units in conjunction with Lovetann. They are built to withstand the harsh climate of Norway, which DOES include a lot of snow, as well as wind. Just to let you, and everyone else know. I've been following this concept since its inception a few years ago, and have read numerous things from Lovetann itself regarding the design and concept. It really is brilliant. Does anyone know if Lovetann is still in operation. They dont seem to have a web site anymore? Do you people have some nice designe idea for energy saving and energy optimization. As in Dallas Texas area there is too much challenge from soaring energy prices and energy star compliance is not that much helping us. I agree with many of these comments. I think modifying the designs for climate variations could be accomplished without major changes. Slightly angled panels could divert snow accumulation, for example. And certainly personal choice plays a big part in the design. Someone mentioned the marketplace, and my only question here is "Are they really selling? Who measures the total sales of these homes?" I'm with g3. I enjoy your site and have recommended it to others interested in great design; but sometimes I feel as though I'm the only person in the world who lives where it SNOWS!! I can't imagine what those flat roofs are going to do with 3-4 feet of snow? Of course, then the freezing rain will come to be absorbed into that snow and add to the weight. This is lots of fun, when it refreezes and thaws and freezes and the ice dams....you get the idea. No one loves cubes and glass and concrete more than I do; but I can't see how such a house could be practical in an upstate New York WINTER. I agree that personal tastes do come into play here. 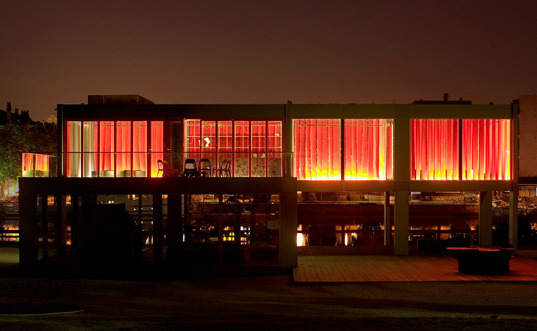 There are aesthetics which can be modified to suit personal tastes in any prefabricated building,i.e. soften harsh site lines. Re: flat vs. inclined roofs-the quality of the construction is the question that must be examined. I question the integrity of the overall building system given that it is "prefab". It has been my experience in the conventional building world that even 'inclined planes' can fail for a variety of reasons. Practically, in any wet clime, a very well built flat roof can fail given enough time. Have 'new technologies' really stood that test of time? While I love the outdoor coming in with all the glass I can't help but wonder about the small army of window washers one must employ to keep bird droppings from being part of the "landscape". I live in a conventionally built house with the best low-E-High-R-value large windows money can buy. Furniture is still fading and the house still heats up uncomfortably in the summer ( we do not use much heat in the winter, though). Good luck in your endeavors....the world must continue to try to find better ways to build housing. I must respectfully disagree with g3. Re: Flat roofs - they do not inherently leak, and new technologies do make a difference. For a bit more discussion on this: http://livemodern.com/forums/dwell/building/71406343272 Re: all that glass - certainly this is a personal choice and will depend largely on the site of the home. I would not personally put this home up for myself in an infill urban lot, however, if I had several acres out away from it all I would love to blur the line between my interiors and exteriors. All that glass is ghastly if it is not low-e, high r value etc. Re: look of commercial building. Of course again this is a personal preferance and I think that there are many out there who will agree with you. Obviously there are many like me who will disagree, or we would not be seeing so many of these designs show up in the marketplace. Re: maintaining a sense of warmth - I agree that people appreciate a sense of warmth in there home and I believe that many of the modern prefab builders have accomplished this through exceptional design - see hive modular.com, the steel construction of Greg LaVardera's designs from EcoContempo, Alchemy Architects, Flatpak, Rocio Romeros LV homes and many others. I respect a difference of opinions/aesthetics and just thought I would share mine. I hate to be a wet blanket at the party, but I've seen a bunch of these very cubical house designs on this site and I have to speak up. 1) Flat roofs are inherently prone to leaking water into a building. I don't care if they have high-tech drainage systems; the most sustainable way to keep water out of a building is with an inclined plane. Flat is just plumb dumb. 2) All that glass is ghastly. Suggests zero privacy, and covering with ubiquitous gaps between them don't help a whole lot in an age where passive infrared viewers are commonly available (to voyeurs too). May as well not bother enclosing the toilet while you're at it. If you want to live in a fishbowl that's your choice, but I for one would sooner eat bugs. 3) These things look like commercial buildings, not like homes. The new one on your front page there looks like it should be a bank. It inhabits a medium emotional distance between warm and cool. It would be very nice, warm, and personally engaging as a bank. But as a home it's cold and distant. By analogy, a handshake is a warm way to greet a client in business, but rather cold among family members where a hug is more appropriate. 4) You can make prefabs, and even industrial looking designs, while retaining the sense of warmth and coziness and hominess and privacy. The 75th Anniversary Airstream trailer is a great example; expand on that and turn it into a 500 or 1000 square foot house on a fixed foundation and it would be fine. Frankly I get the sense that one of the things people love most about retro designs is that they resemble something mammalian, whereas much of 21st century design resembles something reptilian or even insectoid. If you're relatively new to Inhabitat, you may not remember when we introduced Lovetann's LEGO-like prefab-modular home concept. A little more than a year later (and following on the heels of their debut as the 100% Norway headquarters during London Design Week), they're releasing two new models for homes! They've also got some gorgeous photos of the fully constructed original Lovetann show home, which we thought we'd throw in to complement the shiny new renderings.